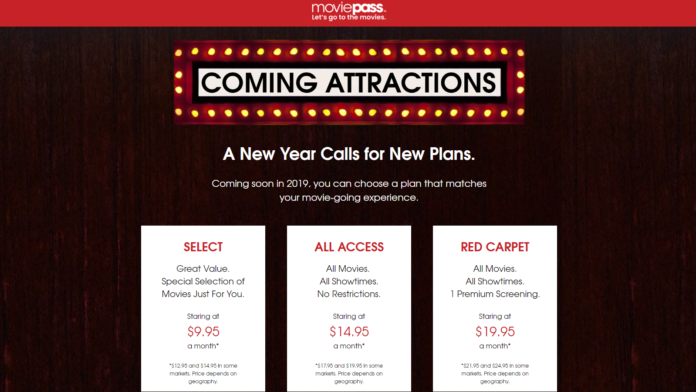 MoviePass has announced their intention to offer three new subscription plans to their customers by January. “Select”, “All Access”, and “Red Carpet”, starting at $9.95, $14.95, and $19.95 respectively will all offer their subscribers three showings per month. The difference between the three tiers will be mainly on the limitations that are induced to the user. For example, the “Select” plan only allows picking movies and viewing times from a limited pool of options. The “All Access” package lifts these restrictions so you can choose any showtime of any movie. The “Red Carpet” adds one premium screening (IMAX or RealD 3D) on top of what comes with the “All Access” plan. Now, all of these prices are nowhere near to what was offered by MoviePass last summer when subscribers paid $10/month for 30 movies per month (1 a day). However, the theatrical subscription service has gone through rough times and wasn’t able to establish themselves financially in the market, so the troubles affected their operations, subscribers started rightfully complaining about a poor level of service, experiencing outages, and many finding themselves blocked out from movies they wanted to watch. All that said, these new plans are the best that can be offered, in an effort of MoviePass to stand on its feet financially. Do you believe in a brighter future for the Cinema business, or do you think that cinema-goers will go extinct soon? Let us know in the comments, and don’t forget to visit our Facebook and Twitter page for more news like this.